Alexander Keith’s has been brewing beer since 1820, and after all of these years the beloved Canadian brand still knows how to keep things fresh! For the first time, Alexander Keith’s is proud to introduce its Original Cider to continue quenching demand for great-tasting products. This high-quality apple cider is crafted with the same careful attention to detail Canadians have come to expect from the Alexander Keith's brand. Backed by nearly two centuries of brewing tradition, Alexander Keith’s Original Cider is crafted to treat taste buds to a crisp, refreshing, clean taste with the flavour of fresh apples and just the right balance of sweet and tart. The best way to experience the taste of this unique alternative to wine, coolers and cocktails is to pour the Original Cider over ice and share it with friends. 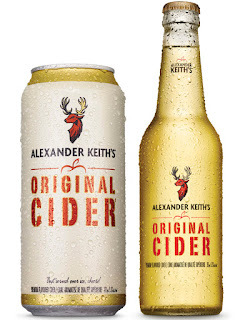 Alexander Keith’s Original Cider is now available at LCBO stores across Ontario in both 473mL single serve cans ($2.95) and 355mL bottles sold in packs of six ($14.00). For more information, please visit www.keiths.ca or www.facebook.com/Keiths.